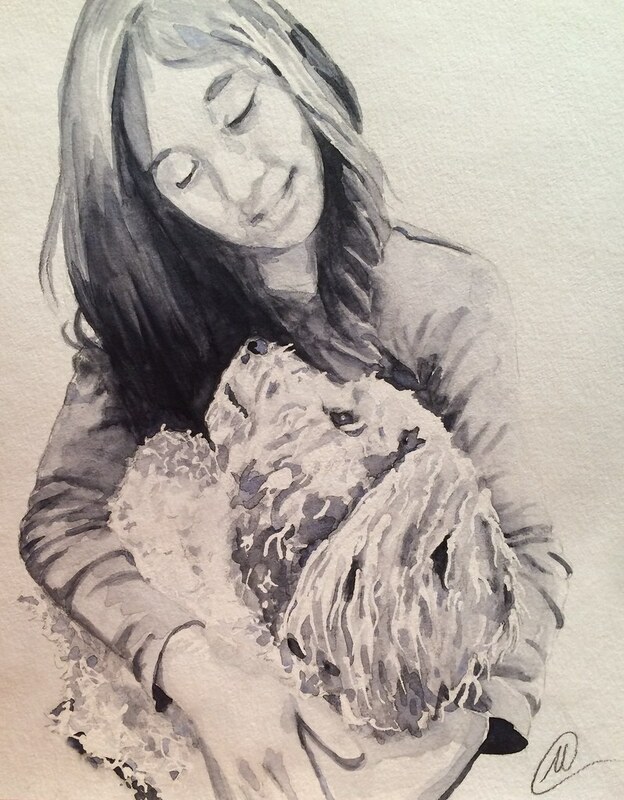 Would you like a portrait of your pet? I can do that for you, and I will make the process super simple! I will paint an 8″x 10″ watercolor portrait of your pet on high-quality watercolor paper that is based upon one of your favorite photos –delivered to your door and ready to frame. All I need from you is a good (not blurry or too dark) photograph of your pet, one I can transform into a watercolor portrait that will hang on your wall for years to come! and also a bit of money– starting at just $44.95, shipping included! I will write back and ask any questions I have about your pet or the photo. You will also receive an invoice with the payment details. I will email you a photo of the finished painting. If you are pleased with the portrait, you will complete the payment and I will ship your painting! Easy! NOTE : Use this to upload your photos by pressing "Browse" and finding your photo... jpeg, tiff, pdf, whatever you have should be fine. If it doesn't work I will let you know :) There is a 2MB limit. High quality is better! Just received the portrait! It’s even nicer in person and my partner is thrilled! –Julia K.
I just want to say thank you so much. When my boyfriend pulled out the portrait you did of my baby girl I immediately burst into tears. I never expected it to be so beautiful. Your painting of her is now my most cherished gift that I have. It’s almost like she’s still here with me. Thank you so much. I know it’s just a painting to everyone else, but it’s so much more than that to me and the joy you and my boyfriend brought to me by doing this is irreplaceable. Thanks, –Amanda S.
Got my portrait today! It looks fabulous… I really like it. I may be sending you an email about one for my dog and my sister’s dog and cat. Thanks so much! –Sheri R.
I got my “Ace” art today, and it’s the talk of the town. Thanks again, you’re awesome! 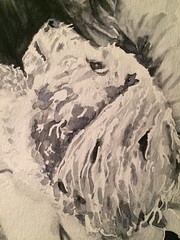 –Mary L.
I really enjoy painting people’s pets. Each experience is different, and I do my best every time. I do not have one “style” of doing pet portraits, and I have fun playing around with different techniques. These are usually fairly simple and expressive portraits that are based upon the pictures provided, but they are not super detailed or photo-realistic. For example, if your dog has one blue eye in the photo, he will have one blue eye in the painting; but, if your dog has one whisker that curves slightly away from the rest and his nose has thirteen distinct shades of pink, I am probably not the pet painter you are looking for. With that said, if you are not happy with the finished painting, I will refund your money. I use nice heavy watercolor paper, which I cut to almost exactly 8×10 inches. This way you can just roll into a local store or Target or wherever and purchase any style frame for an 8×10 picture. A $5 frame will work just as well as a crazy expensive one, and you get to choose! Copyright © 2019 Marcus Colburn Art All Rights Reserved.